MNA – In a ceremony attended by Iranian, Iraqi, Yemeni, Bahraini political figures, a documentary film about a 17-year-old holy shrine defender was displayed in the holy city of Qom, Iran. 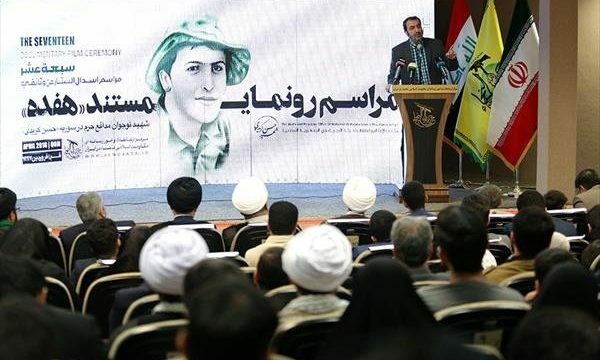 The 17-minute documentary depicting the life and martyrdom of the 17 years old fighter of Iraqi al-Nujaba , “Hassan Kreidi,” was screened for the first time. According to a report by al-Nujaba Islamic Resistance Centre (http://alnujaba.ir) in Iran, on Saturday, April 7, 2018, the “Seventeen” documentary showing the life of martyrdom of the 17 years old fighter and defender of the holy shrine, was held in the Ayeh Cinema, in the holy city of Qom, Iran. This special ceremony was held in the presence of the aforesaid martyr’s respected parents, diferrent Resistance groups’ representatives, military-administrative officials of Qom province, the families of the holy shrine martyred defenders, media correspondents, seminary and university students as well as ‌‌‌Iranian IRGC commanders, representatives from Iraqi Harkat al-Nujaba, Yemeni Ansarollah, and Bahraini Ayatollah Isa Qassim. According to the report, the former Iranian TV & Radio correspondent to Syria and Iraq, “Hassan Shemshadi delivered the opening speech. What’s behind Trump’s Syria pullout remarks?